Vegetables look lovely mixed with flowers. Brassica are part of the mustard family. There are over 30 species, both wild and cultivated. 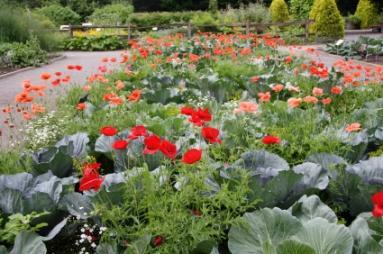 Not only are brassica edible, often they are planted for their decorative value as well. Brassica vegetables are very nutritious and versatile. Most are good sources of vitamin C and fiber. They are also thought to have cancer fighting nutrients as well as iron, potassium and calcium. Sometimes brassica plants are also used as forage for farm animals, although this should be done with caution. Improper grazing can contribute to health problems in livestock. Brassica plants often prefer cool growing seasons. They are great in the fall or very early spring. This is a great way to extend your garden season as many of them actually improve in flavor after a mild frost. Cool weather is also the best way to protect these vegetables from insect damage. Hand pick hungry caterpillars who enjoy munching on brassica vegetables. Brassica prefer rich, well drained soil and benefit from regular fertilizing to stay healthy. Consider amending the soil with manure or a rich compost before cultivating the garden for brassica. Most brassica can be started from seeds, however many people find it easier to purchase plants from a local garden center. Be sure to leave enough space to allow for the full growth anticipated for the plant. Over-crowded plants are not healthy and tend to have problems with pests. Water regularly, especially in hot weather, to prevent vegetables from splitting.